Big Labor-Backed political activists anxiously await Janus ruling. On February 26, the U.S. Supreme Court heard oral arguments in what Washington Post editors call “the most important labor case of the 21st century to date,” Janus v. AFSCME. Mark Janus, the plaintiff in this case, is an Illinois civil servant and union nonmember compelled by state law to pay monthly fees to officers of the American Federation of State, County, and Municipal Employees union and its Chicago-based AFSCME Council 31 affiliate. If he refused, he would be fired. 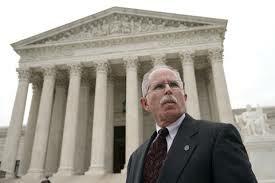 At the hearing, Mr. Janus’ counsel of record, Right to Work staff attorney Bill Messenger, and U.S. Solicitor General Noel Francisco argued that pro-Big Labor laws in Illinois and other states are unconstitutional. Such laws violate the First Amendment, explained Mr. Messenger and Mr. Francisco, when they force public servants like Mr. Janus to support union-boss political and ideological advocacy directed at public officials.